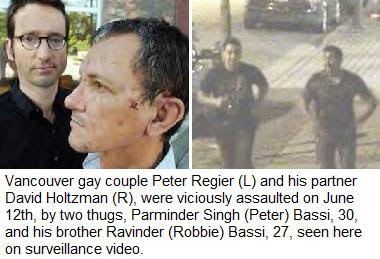 Some good news in the gay bashing case of Peter Regier and his partner David Holtzman, who were beaten as they tried to enter their townhouse on June 12, 2010 in Vancouver, BC; police have charged two brothers with the assault. "The maximum sentence for assault causing bodily harm is 10 years in jail. However under Section 718.2 of the Criminal Code, a judge can impose a stiffer sentence if there is "evidence the crime was motivated by bias, prejudice or hate". At a news conference at the police station today (July 1), Const. Jana McGuinness said that Richmond resident Parminder Singh (Peter) Bassi, 30, faces two counts of assault causing bodily harm. His brother Ravinder (Robbie) Bassi, 27, is charged with one count of assault causing bodily harm. "They've since been released from jail and they have a number of strict court-imposed conditions that they have to abide by," McGuinness added. "Neither man has a criminal record."